Despite being seen — at least, in the eyes of The Daily Show's Trevor Noah — as America's sexiest Democratic presidential candidate, Martin O'Malley still has substantial hurdles to overcome if he wants to win the 2016 nomination. Monday night, in an interview on the Comedy Central show, O'Malley tried separating himself from former friend Hillary Clinton, the current Democratic frontrunner. The former Governor of Maryland attacked the former Secretary of State for several minutes for not being the "independent" candidate America needs, who's capable of fighting Wall Street and governing the financial sector. But he endorsed Clinton in 2008, so what gives? O'Malley's friendship with, and political allegiance to, the Clinton family stretches back some 15 years. He got to know the Clintons when he was mayor of Baltimore in 2000. At the NAACP Convention that year, hosted in Baltimore, O'Malley asked to be included in a White House delegation to Northern Ireland. He got to tag along with some of the administration's top aides and fundraisers, and many remember him for playing guitar on the trip (he's the the frontman for a Celtic rock band in Baltimore). Given that the people he met on the trip would later help him in his run for governor, O'Malley owes a lot of his later success to the Clinton's. The trip, though, was just the beginning of their political ties. Former President Bill Clinton and O'Malley worked together on the Democratic Leadership Council, a policy organization. After the Sep. 11 attacks, O'Malley worked with then-Senator Hillary Clinton on anti-terrorism policies. Then, Bill recorded a television ad for O'Malley's 2006 gubernatorial campaign, and just a year later, O'Malley announced his support for Hillary's candidacy in the Democratic primary. "Today, it is with great pride and enthusiasm that I endorse my friend, Senator Hillary Rodham Clinton, to be the next president of the United States," he said in Annapolis standing next to Hillary. He was the second governor in the country to endorse her. As Trevor Noah asked on the program, what's the difference between 2008 and today? O'Malley said, "As our times change, as our challenges change, I believe that new leadership is required." On The Daily Show, he hammered home on Clinton's connections to Wall Street: "She said in the debate, 'I represented Wall Street.' And yes, she did." This isn't the first time O'Malley has attacked Clinton. In an interview with CNN's Dana Bash just before the first Democratic presidential debate, he said "Secretary Clinton is always quick for the military intervention." He has also accused her of flip-flopping on issues like Keystone XL, and has said that the investigation into her private emails is legitimate. Yet in the debate, he was friendly and didn't attack her directly. 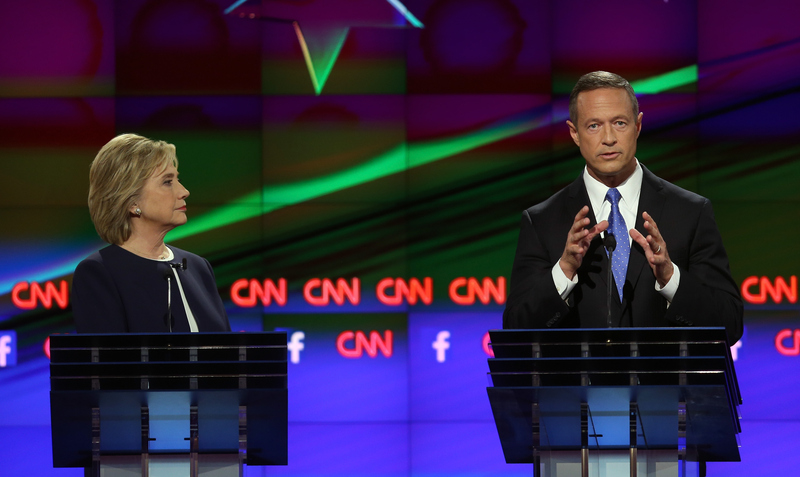 Some have suggested that O'Malley is really running to be Clinton's eventual running mate. Before announcing his candidacy, he called her personally to tell her he was running. Her Twitter account then welcomed him to the race. So are they friends or foes? Pundits have suggested since the start of the race that his candidacy can only help her. Maybe that's true, but he better watch his step if he's vying for the VP slot.